To get into the festive spirit, you know what to do; Christmas films. 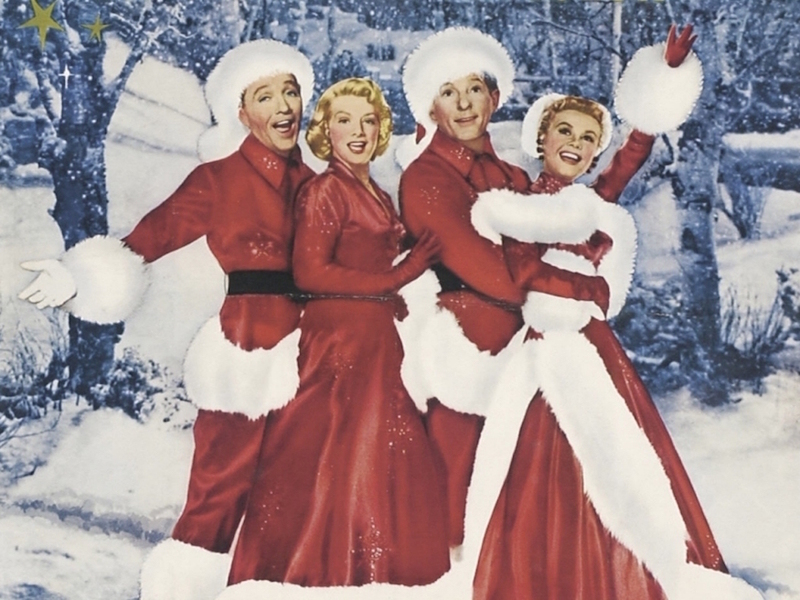 Lots of venues screen festive classics in the weeks before Christmas — take a look below. Note: we'll be adding plenty more events for Christmas 2018 when they're announced, so keep checking back. Take a look at our Christmas in London page for further inspiration. 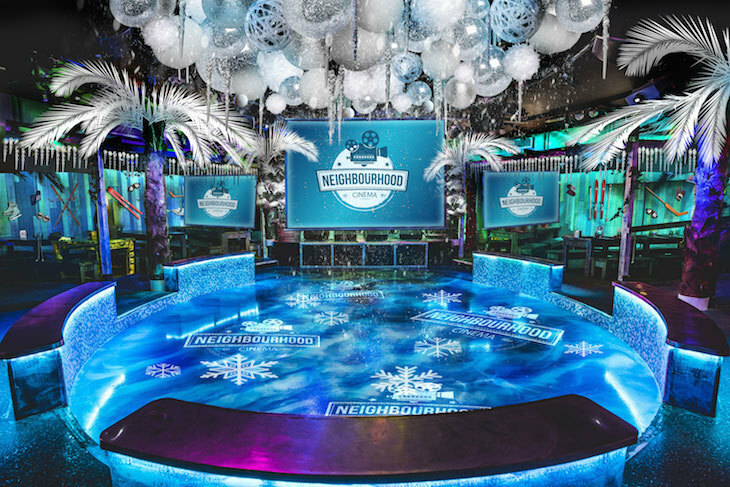 Frozen Island is the theme of Neighbourhood Cinema, popping up in a secret Covent Garden location with frozen palm trees, icicles and giant snow globes. There's an ice bar next to the screening room, and VIP snow cabins available to hire. Screening are a mixture of family favourites and adults-only, booze fuelled singalongs. 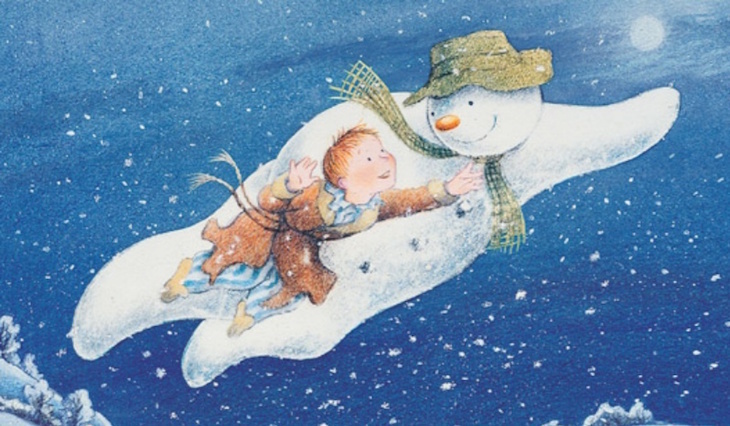 Roaming movie theatre Backyard Cinema pitches up at Hyde Park's Winter Wonderland this season for an "immersive cinematic adventure" celebrating the 40th anniversary of The Snowman (that's the Raymond Briggs children's book, not the crime thriller, FYI). Rather than sitting to watch the film, you'll walk through different rooms designed to bring the scenes to life. Thank goodness it's only a 20 minute film, eh? Fancy hotel One Aldwych runs a season of fancy film screenings each Christmas. Watch the film in the hotel's screening room, with a glass of champagne, and then head to the on-site restaurant Indigo for a three-course meal once the credits roll. This year's programme includes It's A Wonderful Life, The Holiday, White Christmas, and Miracle on 34th Street, among others, all screened on multiple dates. 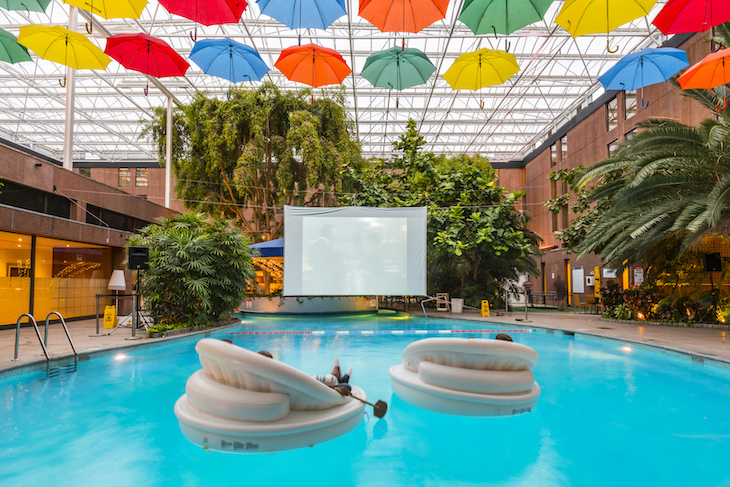 Love Actually, Moulin Rouge and Pretty Woman are the next three films to be screened at Poolside Cinema Club in the Sky Garden at the Sheraton Skyline Hotel. Choose whether you snuggle under a blanket on a floating sofa in the pool, or lounge on a beanbag on dry land. The transparent roof means you'll feel like you're under the stars — without the outdoor chill. Ticket price includes a welcome drink and popcorn, with other food and drink available to purchase. 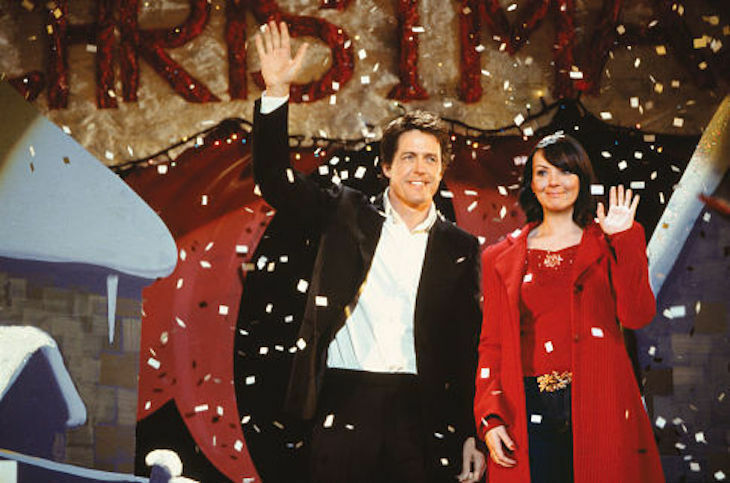 Richard Curtis's 2003, London-based rom com has one heck of a cast: Hugh Grant, Colin Firth, Emma Thompson, Martine McCutcheon, Laura Linney, Liam Neeson, Bill Nighy, Keira Knightley... all telling the interwoven stories of 10 couples around Christmas time. Following last year's event, it's being screened accompanied by a live orchestra once again, in the opulent settings of the Theatre Royal. 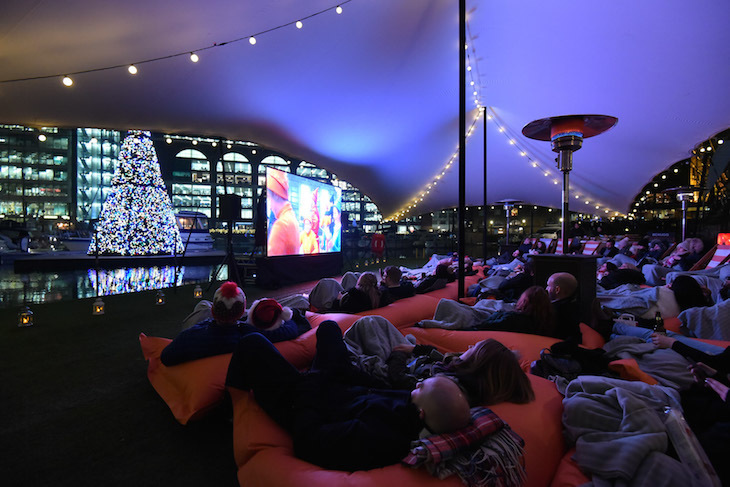 Elf, Home Alone, Love Actually and Arthur Christmas are just some of the screenings at this floating film festival in St Katharine Docks. Wrap up warm, kick back in a deckchair or beanbag on a floating pontoon and watch the Christmas classics. Blankets and heaters are provided, and mince pies, mulled wine, hot chocolate and other warming goodies will be available from Benugo. Think Narnia and you've got some idea what they're going for when they construct this cinema in Hackney. 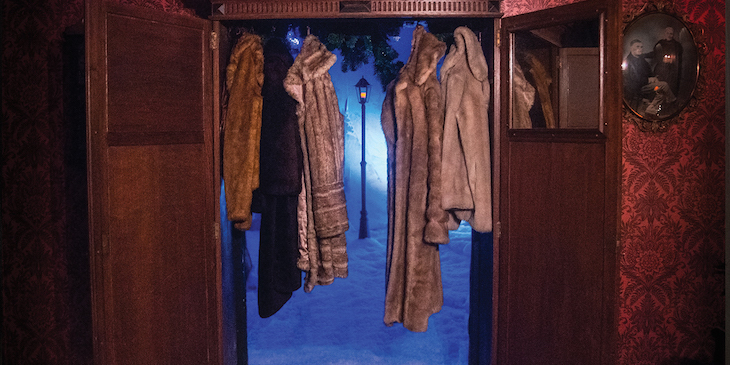 Walk through a wardrobe to a snowy screening room, where you can watch festive classics including Elf, Home Alone 2 and The Santa Clause in the snow. It's indoors, and there's a bar where you can buy warming refreshments. Best-known for popping up at quirky London locations throughout the summer, Luna Cinema also runs a winter screening programme. The venues for the London Christmas screenings are Kensington Palace and Earth (Evolutionary Arts Hackney), with the likes of Elf, The Holiday and Die Hard on the programme. It's almost 30 years old. 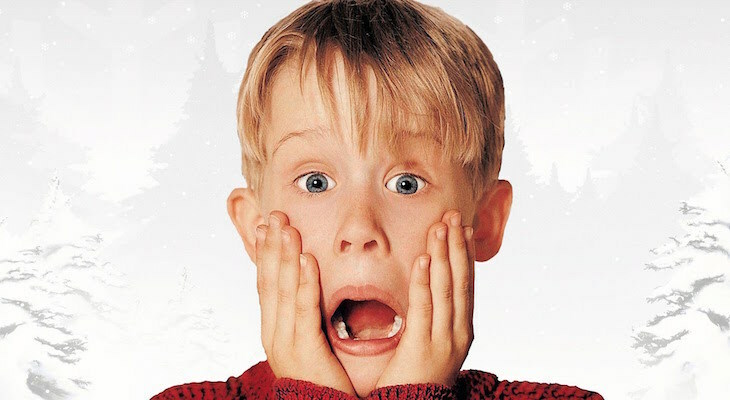 You've probably seen Macaulay Culkin's festive antics multiple times before (it's been around since 1990, which makes us feel old), but this year, the Royal Albert Hall is screening it with a live orchestra performing John Williams' score, just a couple of days before Christmas. The beloved Prince Charles Cinema puts on a whopping number of screenings each Christmas related films each year, and 2018 is no different. The website breaks down these films in two categories, a nice list with your more traditional Christmas fare, and a naughty list featuring some edgy options. There's so much to choose from and incredibly the cinema is showing It's A Wonderful Life twice a day throughout December until Christmas Eve. Some screenings are sing-a-long, some quote-a-long and others come with a mince pie and sparkling wine. Know of any other Christmas film screenings in London? Send the details over to hello@londonist.com.